"A wonderful blend of your dog's favorite tastes all in one treat!" In a medium bowl, stir together the wheat germ, milk powder, egg, yeast and liver baby food. Add water if necessary to make a workable dough. Drop by teaspoonfuls onto a greased cookie sheet. Bake for 20 minutes in the preheated oven. Remove from cookie sheet to cool on wire racks. Store in an airtight container in the refrigerator. 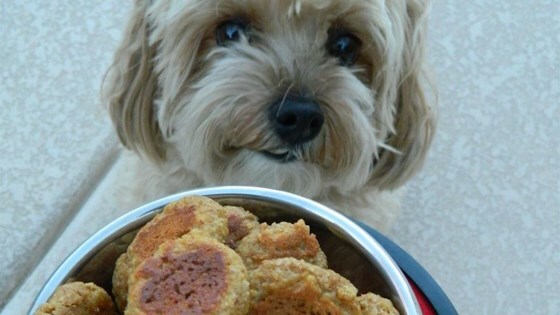 Save money making your own dog treats from scratch. Beef baby food can be substituted if liver flavor is not available. My brother and I thought this was really easy to prepare. We don't have a dog (yet!). My pups loved this. Thanks for the recipe! my 2 picky eaters loved them and the treats are healthy. My dogs loved it. I could not find liver so I used beef.